A trip down memory lane from London’s own king of kitsch. 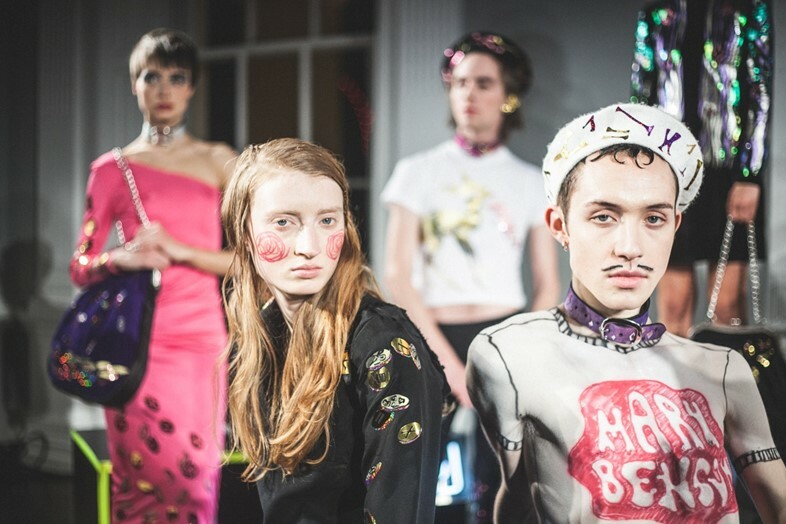 This season CSM grad Marler looked to his own past for inspiration – specifically, the chintzy Spanish home of his expat, ex-pub owning grandparents. 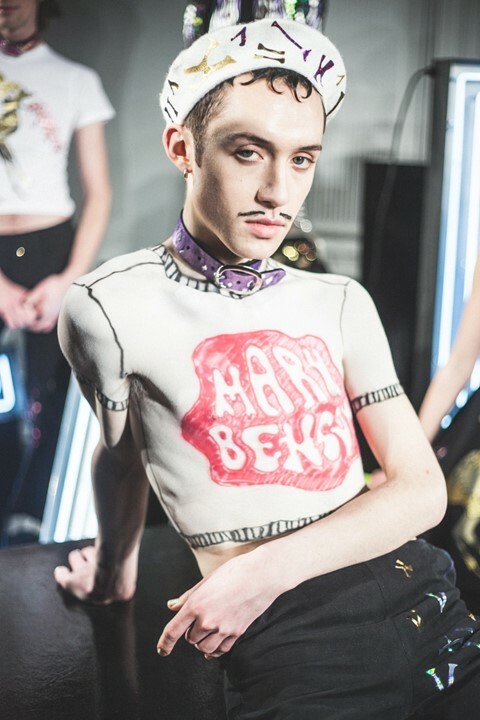 With Only Fools and Horses and Princess Di on his moodboard, the collection riffed off the best of British camp – Marler’s mates strutted and danced down the runway in corsets, frills, leopard print and glitter heels. “Everyone was a separate character, I told them to just have fun with it,” he said after the show. 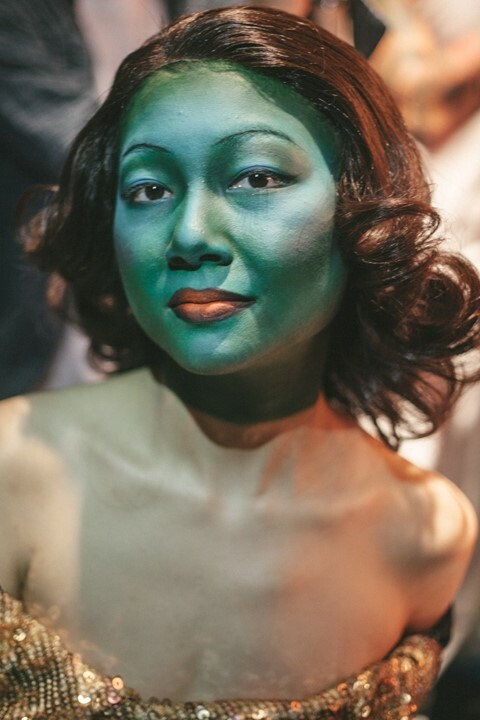 One model appeared on the runway as a perfect incarnation of Vladimir Tretchikoff’s infamous “Chinese Girl” – otherwise known as “The Green Lady” – one of the most recognisably kitsch, wildly reproduced paintings of the last century. “The collection is supposed to be about typical working class British culture – that picture is an iconic part of that,” explained Marler. If cult classic The Warriors had featured a glam rock gang. Created with Dazed 100 make-up artist Isamaya Ffrench, colourful paint decorated faces like playful warpaint – noses and ears were coated in metallic glitter, a giant gold star covered a model’s face and one even sported a body-painted T-shirt. “We wanted it to look like a gang, as though they’ve just put it on themselves,” Benson said. Let me see that thong. South London rude girls in super upgraded sportswear – with visible g-strings to “off set the princessyness” of big satin skirts. With colour coordinated Nike Air Max 1s, gelled baby hair (a reference to the classic slicked back style without “being too severe”) and big gold hoops – Price’s styling felt authentic rather than appropriative.